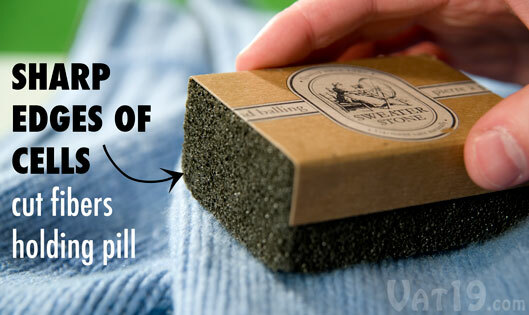 Sweater Stone: Eco-friendly and effective removal of pilling. 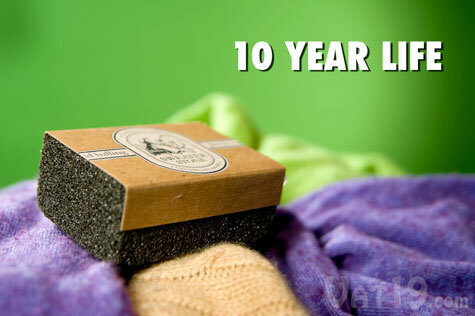 Remove the unwanted pilling and balling on your sweaters with the magical Sweater Stone. 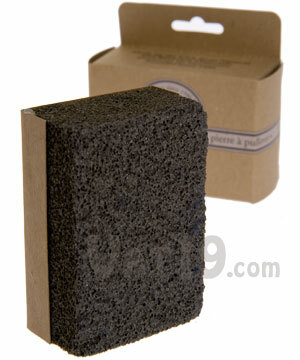 This small and lightweight pumice-like stone restores the luster of your sweaters, knits, cashmere, upholstery, towels, shirts, and even bedding. Simply brush The Sweater Stone across problem areas and the cells within the lattice of the stone will remove those irritating pills and balls. Each tiny cell features sharp edges that literally cut the tiny strands of fabric that secure the pills to your garment. As they cut, the cells dislodge from the stone, eliminating the possibility of snags. The Sweater Stone is made in the USA by the functionally disabled and features a 10-year life. Dimensions: 3.5" x 1.5" x 2.25"
The Sweater Stone is by far the best fabric pill remover we've ever used. 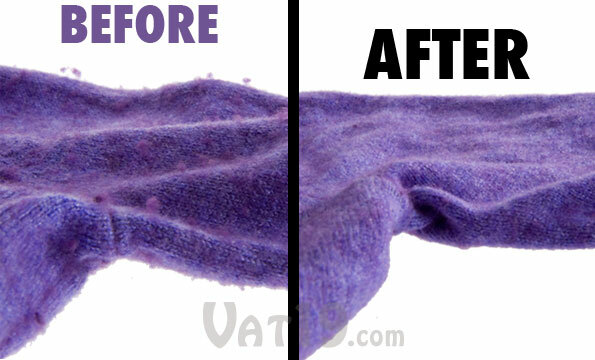 Simply brush the pumice-like stone gently across your sweaters to remove any pilling and make your garments look brand new again. The cells within the Sweater Stone conceal sharp edges that free the fibers holding those annoying pills to your garment. As soon as the cell cuts the fiber, it falls off the stone. This crumbling action eliminates the snags that you often get with electric sweater shavers. The Sweater Stone eliminates sweater pilling to restore that brand-new luster. The Sweater Stone is simple to use, doesn't require batteries, and works quickly. Simply brush over a garment to remove the pilling and balling. In the close-up photo below, a purple sweater suffers from excessive pilling after a trip through the washing machine. With just a few minutes and the Sweater Stone, the sweater is looking nearly flawless. The Sweater Stone restores this purple sweater to practically brand-new in minutes. The Sweater Stone literally cuts the pills from your sweaters. The stone contains thousands of small "cells" that feature sharp edges that can cut through the fibers holding the pills and balls to your garment. As they cut, the cells crumble away from the stone. So, as you brush the stone across the fabric, the pills will be removed without any fear of getting snagged and damaging your clothing. Of course, you needn't worry that the Sweater Stone is going to slice off your fingers. Like any pumice, the Sweater Stone is completely safe to the touch. The unique crumbling action of the Sweater Stone both removes pills and prevents snags. The Sweater Stone will remove pills and restore the original luster of sweaters, knits, cashmere, upholstery, towels, shirts, and even bedding. Each small stone has an expected life of 10 years. So, don't toss out that old sweater. Use the Sweater Stone to breathe new life into it. including cashmere, upholstery, towels, shirts, and bedding. Question: If the Sweater Stone cuts the fibers, will it cut my hand or rip through the sweater? Answer: No. Like any pumice-like stone, the Sweater Stone is completely safe to touch. Also, it will not tear through a piece of clothing. As you gently brush across the garment, the sharp edges of the stone's cells cut the small fiber strands that hold the pills to the fabric. The cells then crumble away from the stone so as to not snag or tear your garment. Question: How is The Sweater Stone better than those electric sweater shavers? Answer: While electric sweater shavers are good for small areas of pilling, the Sweater Stone can restore the luster of an entire garment quickly and without any fear of snagging. Plus, the Sweater Stone doesn't require batteries. Think of how annoying it would be to try to find batteries for your sweater shaver when you're rushing to get ready. With the Sweater Stone you can simply brush away the pills and be on your way. Question: Am I going to have a big mess of "crumbs" after I use the Sweater Stone? Answer: The tiny crumbs are inevitable (as they're what prevents snagging), but they certainly aren't a "big mess". You can simply shake the residue off the garment.